I wanted to post this recipe yesterday, but I was pulled into the swirling vortex of holiday shopping known as “the mall”. It was exhausting, but I did finally finish up the last bits of Christmas shopping on my list. I did do a good amount of local shopping, but I couldn’t avoid the mall entirely. I need to plan better next year. This seafood casserole is a passalong recipe from a volunteer at a previous job. I’ve made it every Christmas Eve for the past 12 years and it has become part of our Christmas tradition. It is very good, very rich and not what I would call healthy food. This year, we are using as many fresh, local ingredients as we can, including all of the seafood. 1. Cook rice according to directions. Stir in egg and 2 Tbsp.of the parsley. Set aside. 2. In a large skillet, melt 1 Tbsp. of the butter over medium heat. Add the onion, carrot and celery, stirring occasionally. Cook for 3-4 minutes or until vegetables are soft. 3. Stir in 1/2 tsp. of dill and salt and pepper to taste. Transfer vegetables to a large bowl. 4. Wipe skillet clean. Pour 2 cups of water in the skillet and bring to a gentle simmer over medium heat. Add scallops and poach until just opaque, about 3 minutes. Remove scallops and add to the bowl. 5. Poach shrimp in the liquid for about 3 minutes or until pink. Remove shrimp to the bowl. 6. Poach the oysters in the liquid for about 2-3 minutes. Remove oysters and add to the bowl. 7. Reserve 1 cup of the poaching liquid and discard the rest. Wipe the skillet clean. 8. Chop the Krab into bite sized pieces and add to the bowl. 9. In the skillet, melt the remaining butter over medium heat. Whisk in flour and cook, whisking constantly for 2 minutes. Do not let flour brown. 10. Gradually whisk in reserved poaching liquid and milk. Cook and stir for about 5 minutes, until thickened. Whisk in cream cheese, remaining dill, salt, pepper and thyme and cook an additional 3-5 minutes until cheese has melted and sauce is smooth. 11. Stir sauce into the seafood mixture along with remaining parsley. 12. Line bottom of a greased 13 x 9 baking dish with the rice mixture. 14. Mix bread crumbs or crushed crackers and 2 Tbsp. butter. Sprinkle over the casserole. 15. Bake at 350 degrees for about 50 minutes or until heated through and topping is golden and crunchy. Garnish with parsley and lemon wedges. Our farmer's markets are busy, thanks to the warmer weather! This was a fairly good week, albeit a busy one! The boneless mini ham from Chinquapin was by far and away the best ham we have ever eaten. Oh. My. Goodness. We made it through the week following our menu and definitely appreciated some lighter dishes in the mix. I’m sure the scale will appreciate it as well. We’re really starting to see a change in the seasons through our food. The apples available at the farmer’s market are not so beautiful and crisp as they were a month ago. Made an apple cake with them, so it wasn’t such a big deal, but they are clearly on their way out. We’re starting to see salad greens and that is a happy thing! It helps that we haven’t had a winter this year–not one flake of snow in our part of North Carolina. Well, yet, anyway. There is still time. Winter can be pretty fickle around here. The unseasonably warmer temperatures are definitely reflected in the early bounty at the farmer’s markets around town, so we’re not complaining. So, our total is a whopping $135.56. I think I just surpassed the savings we had last week, so will try to rein it in for next week! Here is our menu for week 6. We are looking forward to trying the fish tacos, which I love, but have never made at home! Ryan Speckman and Lin Peterson are ready for your seafood questions! Ok, this isn’t the actual sign on the booth of Locals Seafood, but it could be. 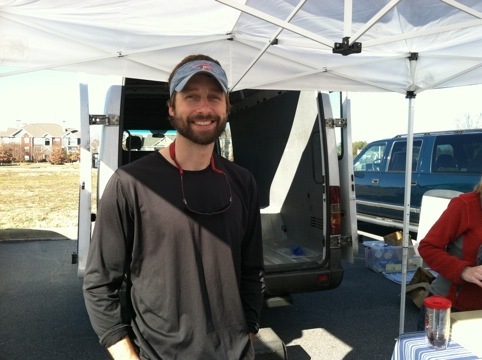 We visited Locals Seafood at the Western Wake Farmers Market in Morrisville and picked up NC shrimp for this week’s menu. All of the fish, shrimp, oysters and scallops sold by Locals Seafood is caught on NC waters in the area around Manteo. Ryan was great at explaining their protocol to me and suggesting some fish options for fish tacos. Because their fish is all local caught, the selection varies from week to week, but their website (www.localsseafood.com) lists their weekly catch. I love that you can text your order in advance and pick it up at the farmers market (great for menu planners like me). 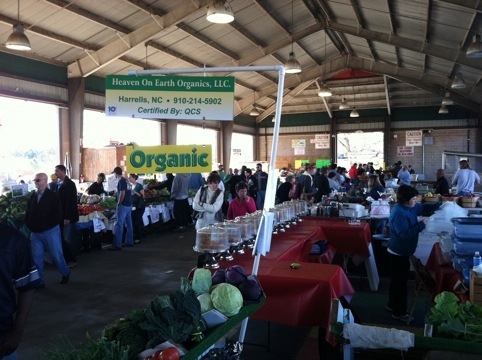 Locals also sells at the Wednesday downtown Raleigh farmers market, which starts up again in April. So glad to have found a great source for NC seafood!